Yay,😁😁😁 I'm back and I know you all miss me for like five seconds. No literally, just like five seconds ago I posted another blog on AG Howard Ensnared 😂😂. So you may be asking yourself, Well why are you back so soon then, Meli? Well, my dear lovely readers it because I couldn't wait to finish telling you about the AG Howard awesome Splintered Series. So let's get to it, shall we? 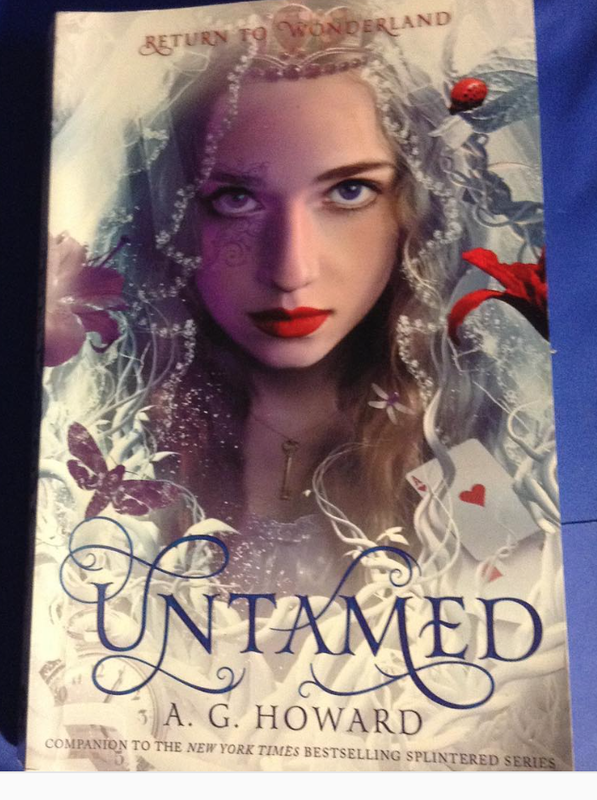 Untamed is the fourth book in the Splintered series but it not really apart of the Series. Wait? Huh? What? Well, you see it has three novellas aka short stories about the series in it. Each of the stories takes place at a different time in the series. One story is about Alyssa Mom, the Second about Morpheus and Jeb. The final is about Alyssa and Morpheus. Now let's get to the details. Story one:"The boy in the Web": Alyssa Mom, Allison is what this story is about👑👑👑. Allison sort of takes you back down memory lane through her life. She discusses important decisions that we didn't understand in the series, decisions about her life and her husband's. This story just gives you more details on her life. This story alone personally would be rated a 2 out of five stars simply because I wasn't as invested in Allison as the rest of the characters🌻🌻🌻. Story two; "The Moth in the Mirror: This story is about Morpheus sorta of tricking the reader into going in Jeb's world🙈🙈🙈. But it also teaches Morpheus that he doesn't know everything about Jeb or Alyssa like he thinks and that if he opens his own eyes, he could learn more🙊🙊🙊. It is a cute simple story about Alyssa's Men. As a stand-alone I would have rated this a 2.5 out of five stars, simply because it was just one-sided in a way yet still tendered hearted. Story three; "Six Impossible Things": This story was my absolute favorite💖💖💖 of three novellas. It honestly could have been a whole book on its own, to simply end the series, the way many of us wanted it to end. It gave the final deep look conclusion that I believe was needed. The story is about Alyssa life and what happens, after all, is settle with Morpheus, Jeb, and Wonderland problems💫💫💫. It is, simply put Alyssa ending to the madness. It made the whole book worth the buy, to be honest. I rated this story a five out of five stars because of how it was written💞💞💞. So my final thoughts on this series is that it is a great ending book to the series of Splintered. Do you need this book to finish the series, no not really but at the same time, I believe the final novella will give a better ending than Ensnared did. The covers on these books are absolutely stunning, colorful and beautiful. I loved all of the covers so much💓💓💓. I cannot recommend this series enough and to be honest I will always recommend it to everyone I know. This book was rated a five out of five stars once again simply because of the last novella "Six Impossible things". Please please pick up this series🙏🙏🙏, like I stated before I am still engrossed by this series and I finish it in December of 2016. It is one of my favorite modern retelling of Alice in Wonderland, to my very core. All information will be listed below for this series.